The mission of the Pomegranate Guild of Judaic Needlework is to pass needlework traditions to other generations of women and men through the sharing of knowledge and techniques needed to create handcrafted items intended for both Jewish ritual and cultural use. We strive to do this in an atmosphere of camaraderie with others and our joy in being Jewish. Thanks to the British Library for their interest in the following project, undertaken by Independent Pomegrante Guild member Sheila Franklin (image and text excerpted from The Paper Pomegranate, Summer 2018). 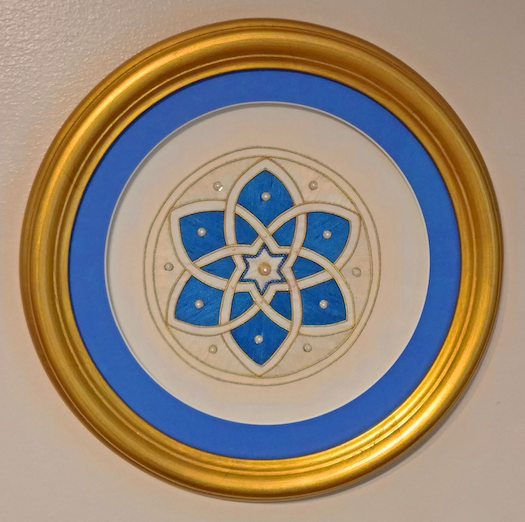 Independent member Sheila Franklin stitched this Maraviglia Star of David pattern originally found as a hand drawn sketch in the margin of a 15th Century Siddur. The prayer book was created by scribe and artist Joel ben Simeon for Menahem ben Samuel and his daughter, Maraviglia. Sheila envisioned the pattern done in gold work, and worked it in various gold threads and wires. The outlines are all gold wire. The white and blue stitching was done with silk thread and it is embellished with small sequins, seed beads and pearls. The stitching was done on dupioni silk and backed by broadcloth. The finished piece was further enhanced with blue matting in a circular gold-tone frame. Donations to the Pomegranate Guild: Send donations to Pomegranate Guild, P.O. Box 60953, Longmeadow, MA 01116. Donations can also be made through PayPal. Click the Donate button below. Pomegranate Guild Logo Apparel: Special order only, click here for information. PomegranateGuildMembers Yahoo Group: To become part of our online sharing community, send an email request to: pomegranateguildmembers-subscribe@yahoogroups.com. In the body of the message, please include your name and Chapter affiliation. Upon verification of your membership, a return email will be sent to you with instructions for joining our Yahoo Groups community. Pomegranate Guild Facebook Group: Pomegranate Guild members may request access to our Facebook page by searching for Pomegranate Guild in Facebook and sending us a request to join. Once membership has been verified the request will be approved. Patterns & Projects: Available in the Members Only section. Convention Photo Gallery: Available in the Members Only section. Seeking volunteers to create one-of-a-kind teddy bears to give to our campers. These bears will provide love & hope and the message that people around the world care about them. Founded by the late Paul Newman, Chaim Topol, and Murray & Marilyn Grant (z’l) Jordan River Village is Israel’s only free, year-round, overnight camp for all children living with serious illnesses and disabilities. Since opening only 8 years ago, the Village has already welcomed 10,000 campers from all sectors of Israeli society—religious and secular; Hebrew speakers and Arabic speakers; rich and poor; Jews, Muslims, and Christians. This website works in all web browsers, though there may be some difficulty seeing links in the Contents column in Internet Explorer. This is a known Microsoft issue. If you have been using Internet Explorer, the Guild recommends Firefox, Safari, or Google Chrome. All three are free to download and use, will protect your privacy more effectively, and are available for both Windows and Mac computers. If you're still running Internet Explorer on a Mac, it's definitely time to get a new computer. If you are experiencing problems with browsers other than Internet Explorer, please make sure that you are running the most recent version of your browser.